When my granddad on my father’s side, William Elkinton Evans, passed away in December 2008, he left a letter addressed to each and all of his grandchildren; the letter had been transcribed by our grandmother, Lucretia Wood Evans. In it he said that we might someday learn the history of our family’s businesses and the work that they did, grounded in Quaker spirit with benefits to employees and consumers alike. My original research on Quaker businesses was done for a class on Quaker social witness taught by Bridget Moix at Haverford College, with the hope of coming to a better understanding of my family history. The excerpts that follow look at two Philadelphia‐based business people whose work philosophies I still see in my family and, I believe, can still be carried by Quakers and others into the workplace today. The first of those is Joseph Elkinton (1794–1868), and the second is Thomas Pim Cope (1768–1854). In the 1920s, in an effort to emphasize equality, the directors decided that all employees—from the lowest level to the president—were to be referred to by their initials. And all employees, including the president (known to his employees as T.W.E. ), began receiving the same annual bonuses. The company’s board of directors established a fund to benefit widows or widowers of employees, and their Labor Reserve Fund provided pensions when people retired, years before Social Security came along. Mentioning profit sharing and the company‐wide salutation “Respected Friend,” the passage also explains the practices of a chemical company that had been founded by Elkington in 1831 as a soap and candle shop. It is important to acknowledge the role that Quakerism played in the life path that led Elkinton to begin the original business. The Philadelphia Quartz Company would not have existed for around 200 years had Elkinton not left a silversmith apprenticeship, and the presumed comfortable life that career would have brought, to pursue something more in line with his values. It seems likely that the job did not seem to sit easy with him in regard to the Quaker value of simplicity. In 1816, he went to establish a school on a Native American reserve. While the endeavor was not necessarily successful and certainly has politically contentious elements that we recognize today (see Paula Palmer’s “Quaker Indian Boarding Schools” in the October 2016 Friends Journal), it is clear that his faith had influenced him strongly enough to forgo a comfortable career in order to teach and live among a community perceived as needy. Thy account of the business is very satisfactory and I may say to thee my son I have entire confidence in thy intention to do the best thou canst, and have no doubt thou wilt be able to get along to thy own satisfaction and mine also, as thou continues to dwell under a proper concern for the best things. The last phrase illuminates the way that business was conducted. In what I would claim as the spirit of continuing revelation—the idea that the most effective expression of our values must be rediscovered with new, ever‐evolving circumstances—the business was to be held under an attentive eye with a mission to pursue the best things. If the oceans of light and darkness are constantly flowing and shifting, then the ways to exist in and contribute to the ocean of light are as well. 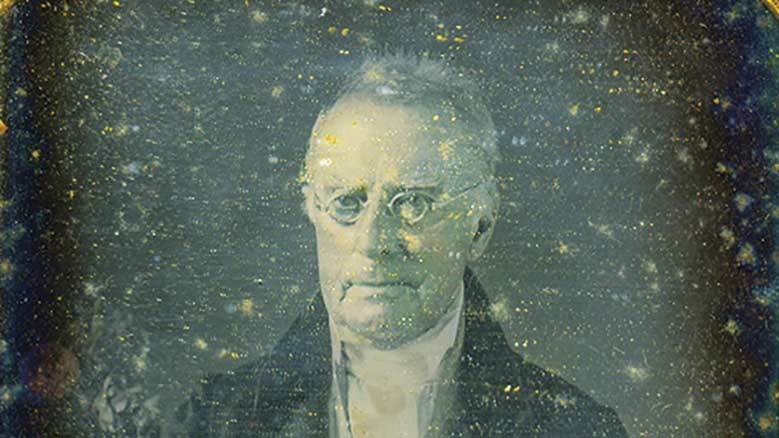 Portrait of Thomas P. Cope Sr., courtesy of Haverford College Quaker and Special Collections. He had always assumed, as had the prominent Philadelphians he had admired in his youth, that it was his obligation, as well as his pleasure, to devote himself, and at least some of his wealth, to the well‐being of his adopted city. Among those prominent Philadelphians were numerous Quakers including a clerk of Philadelphia Yearly Meeting, John Field, who Cope speaks fondly of as he recounts his early career. Cope’s journal entry from December 25, 1846, when he was 78 years old, recalls the beginnings of his business career. Like Joseph Elkinton, he faced a career‐determining moment early in his life. As his first venture, he began doing business with his uncle Thomas Mendenhall, “literally without one cent of capital.” His uncle engaged in a “wild scheme of speculation in scrip of the First Bank of the United States” and pressured Cope to engage in speculation as well. He declined, saying he was not “willing to hazard my own character and the property of others who had trusted us in such a lottery.” When he found out his uncle had proceeded with the speculation using the name of the firm that they were partners in, he sought legal help from his future father‐in‐law, John Drinker, and the clerk of Philadelphia Yearly Meeting, John Field. This was just the first in a lifetime of business decisions made on the thoughtful basis of maintaining integrity. A profile done on Cope in Hunt’s Merchants’ Magazine and Commercial Review in April 1849 revealed his character: “he could not justify to himself any undertaking which, built on the confidence of his contemporaries, should so abuse that faith as to make the chance of his own prosperity the means of injuring his friends.” To risk the suffering of others for the sake of personal gain was unacceptable. He had a reputation, a position, made as a merchant, which promised him even larger opportunities for usefulness while it had engagements and obligations which he could not neglect or sacrifice. If the principles of Quakerism rest in the immutable basis of truth & justice, as I trust they do, why not disseminate them? Why not carry them into the public councils of the country? His most known venture was the line of packet ships, the first fleet of ships to make regular trips between Philadelphia and Liverpool. These businesses were so vital for the prosperity of the city that he could not in good conscience let go of the management of such affairs in order to accept positions of honor. There are two adjectives that find their way into the conversation about a person’s purpose: “useful” and “worthy.” To be useful and to lead a worthy life are intentions that have driven my family in their career choices. To be of the most use is vital to living a worthy life. In his letter, my granddad stated that he hoped that we would each “lead a worthy life.” Accordingly there is an emphasis placed on education as the means by which someone is able to produce their most useful ends. While I am still unclear of the direction my own life and career, I have faith that these principles can guide me. I want to create spaces of collaboration, free of violence, which produce shared prosperity. It is a constant dialogue between deciding what work most urgently needs to be done, what work I would enjoy, and what work I would be most useful doing. Do I study law to systematically defend human rights? Do I go into business that intentionally seeks to direct wealth to capable humans who have been marginalized? Do I try to do whatever makes me the most money so that I can redirect that wealth toward worthy causes? Do I travel the world to develop policies that shift our world toward clean energy or effective, peaceful global governance? There are pros and cons to each choice. There are contentious life‐altering decisions to be made, akin to the family’s decision in 2005 to relinquish ownership of PQ Corporation, successor to the Philadelphia Quartz Company. Our family now faces a learning process to figure out how to use resources in a socially responsible manner without the framework of the familiar business model. It’s a challenge that many Quaker family business owners increasingly face. They, today and together with their spouses are living their own lives in worthy ways, serving others in need, and nurturing and educating their own growing children—our eight grandchildren!—in preparation for living worthy lives of their own. So from Thomas Pim Cope and Joseph Elkinton to my grandparents, and present in my family now, the principle of living a worthy life continues through the generations. Creative, useful ways are sought to express the best of Quaker faith, whether through business, medicine, art, service, education, direct action, or other means, a responsibility is bestowed upon our generation to act with intentional care and concern. As the end of my grandparents’ 1967 Christmas letter read, “All too often we fall short of this goal for peaceful living in our own lives, but we shall keep striving toward it.” Our lives can seek out the still, small voice and attend with proper concern to being of great use. It seems that should be deemed a worthy life. the examples of career choice being discerned by inward questioning. Seeking a purpose in each activity seems appropriate for Quakers. The article brings me guidance today in a choice I face. I ask what is my purpose? and is it worthy? Will I use my efforts to benefit others or just myself?